(CBS) - What the surgeon's knife takes, seems like nature gives you right back. According to new research out of the University of Colorado, liposuction patients who had fat deposits removed from one part of their body were shocked to find new fat deposits appearing elsewhere. In the studied cases, researchers looked at non-obese women who had the fat sucked out of their thighs and lower abdomens. Fast forward one year, and the fat all came back in the upper body, particularly in the upper abdomen, shoulders and triceps of the arms. 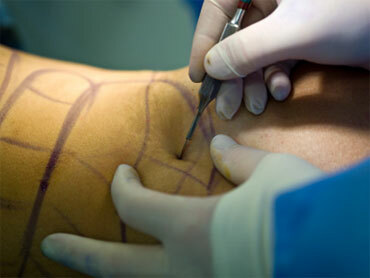 Liposuction, which typically involves injecting large amounts of medicated fluid into fat deposits, then sucking the fluid and the fat out of the body, is primarily a cosmetic procedure. It is not a treatment for general obesity. And it has side effects too, including shock, infections, uneven appearance and scarring. But that hasn't blunted its popularity. Americans underwent around 200,000 liposuction produces last year, making it the fourth most popular form of cosmetic surgery, according to the American Society of Plastic Surgeons. The idea of a quick shot to remove ugly fat deposits is so alluring that more than half the women in the control group of the study (the ones who didn't have the surgery for the first year) opted to have it anyway even after hearing that their counterparts had already gained the fat back in odd places. "It's another chapter in the 'You can't fool Mother Nature' story,'" Dr. Rudolph Leibel, an obesity researcher at Columbia University who was not part of the study, told the New York Times.